Mild-mannered, informative, listens well, did not feel rushed. Staff was very friendly and efficient. ATTENTION NEW PATIENTS - Kindly plan to arrive 15 minutes prior to your scheduled appointment time in order to fill out necessary paperwork. Thank you. 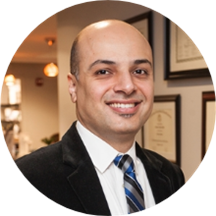 Dr. Hadi, a board-certified dermatologist and Fellow of the American Academy of Dermatology, earned his MD degree from New York University School of Medicine. He completed his dermatology training at The Mount Sinai Hospital in New York City, where he was chief resident in his final year. Dr. Hadi practices general medical dermatology, treating numerous skin conditions such as acne, eczema, warts, and skin cancer. Moreover, he has spearheaded numerous skin cancer screening and awareness events, earning recognition from the American Academy of Dermatology. Dr. Hadi is a Clinical Instructor of Dermatology at the Icahn School of Medicine at Mount Sinai. He has authored numerous articles in peer-reviewed dermatology journals and has served as a reviewer for the Journal of the American Academy of Dermatology as well as other prominent journals in the field of dermatology. Professional and detail oriented. Listens and won’t rush you out the door. Very quick to see Md. Great bedside manner. Dr. Ahmed and he’s assistants were amazing. staffs were really friendly! Didn’t have to wait long it was a in and out type of consultation. Dr. Ahmed was very pleasant and handsome. Great personality and sense of humor. Im please with this visit. Thanks again. Will be coming back again. This was my first time ever going to a dermatologist and Dr. Hadi definitely met my expectations and then some! He was very nice, professional and knowledgeable. Explained everything to me and answered all my questions. He definitely knowswhat he is doing. Glad I made the right decision to go into his office. His staff was also very friendly and everything went smoothly. Would definitely recommend him! It was really GREAT. Dr. Hadi is very knowledgefull, professional and friendly. Excellent doctor and amazing staff, he was very clear and thorough during my visit and addressed all my concerns. I definitely recommend Dr. Hadi! I am amazed with Dr. Ahmed Hadi’s bedside manner! I have been looking for a dermatologist that listened to my concerns about my skin and offered positive solutions and he delivered! He never once rushed me out and always answered any questions without hesitation. 10/10 would recommend. Great Dermatologist... and I know most of the derms in bergen county thru work... this guy it terrific! Dr Hadi is great. He is very thorough and has a great bedside manner. He takes his time and I would highly recommend him if you're looking for a dermatologist. Went in for an eczema issue. Nurse saw me right away and then doctor came in. Doctor seemed knowledgeable and took the time to answer my questions. I go back in three weeks to see if the medication and recommendations helped my issue so stay tuned! Dr.Hadi is an excellent Physician, he was so thorough spending quality time with me answering all my questions and having a full details regarding my complains and prior issues with my skin. It was so hard for me to find agood Dermatologist who doesn’t rush you and hand you a perscription with follow up appointment in 5 minutes!!! That’s not the case with Dr.Hadi. He is so caring and genuinely looking into helping you and finding the right treatement for you. This doctor is always so sweet and approachable! I always feel so comfortable and he's always very open about what he's doing. He is a great dermatologist !! Can't say enough about him also staff and office very good!!!! Not a long wait time and all very helpful!! Would highly recommend!!! First time meeting with Dr. Hadi, and overall it was a very good experience. He did not seem rushed and took time to answer all of my questions and explain my options. He did not come off as the warmest physicianI've ever dealt with, but his bedside manner generally was good. I would go see him again. I was very pleased with my appointment. Dr. Hadi was very professional and has a great bedside manner! He took time to explain things to me and allowed me time to ask questions. I would highly recommend him to anyone needing dermatology services! Dr. Hadi was friendly and professional. Appointment was quick and efficient. WI'll def return for my best skin cancer screening. I thought he was very professional & very helpful !! Really nice and friendly! Was very gentle with the procedure as well. Great doctor! knowledgable, professional, great bedside manner. quick and simple. Dr. Hadi is very nice, calm and reassuring. Dr. Hadi was so nice, thorough and professional. Very professional, excellent bedside manners. Took care of everything in a fast and courteous way. Dr. Hadi is now my long term dermatologist. He was efficient and made sure I didn't have any unanswered questions. For my first visit, I was completely satisfied with the promptness of the staff. Dr. Hadi was cordial, professional and attentive. I was totally satisfied with his diagnosis and would recommend him and am now his one of his patients. Great doctor and explained everything he was looking at, as well as the follow up process. I was very pleased with Dr. Hadi. He was kind, reassuring, and patient with my mother who is elderly and has dementia. Dr. Hadi put my mom at ease and she liked him very much- and that's saying something from my mom who usually finds fault with everyone!